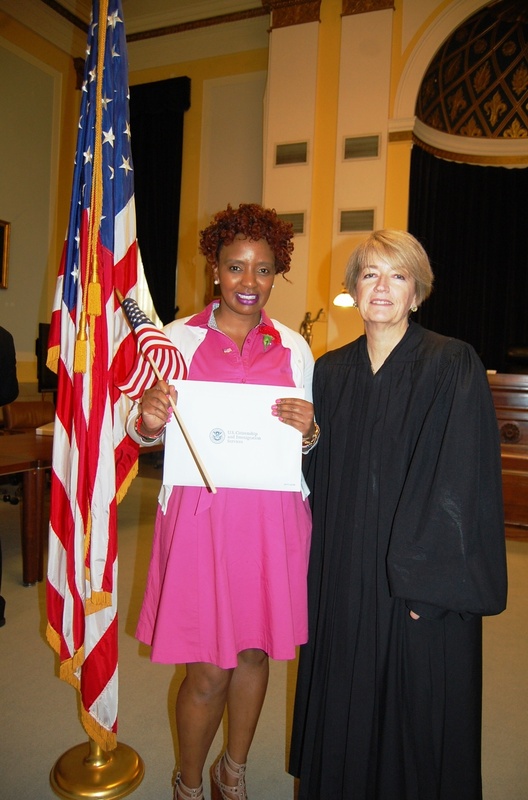 On Friday June 17, 2016 I attended my first Naturalization ceremony inside the Lancaster County Court House. Along with my colleagues from the Maasai Cultural Exchange Project (MCEP) we witnessed the naturalization of Esther Lemaiyan, a Maasai from Kenya, East Africa. Esther first traveled to America in 2003 while working for Simba Maasai Outreach Organization (SIMOO), the NGO in Kenya that partners with MCEP. Joining us was Esther’s sister Mildred, who had arrived in Lancaster last year. Mildred has begun her naturalization path toward American citizenship and is currently attending Harrisburg Area Community College (HACC) as she studies for her RN degree. 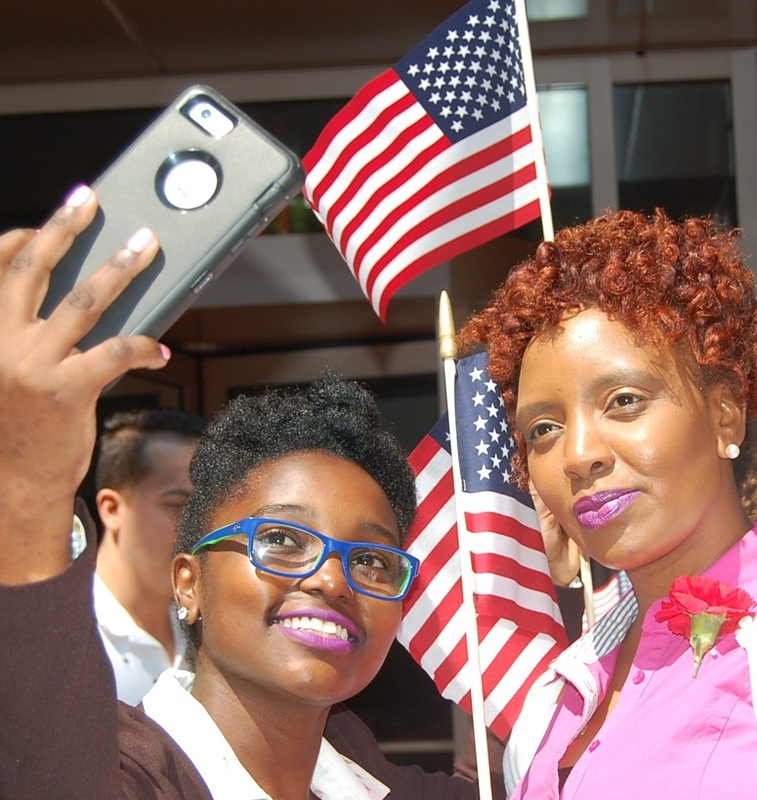 We were seven people of nearly a hundred others who traveled to the Court House to witness the naturalization ceremony of family members or friends. Although we were on time, it was nearly an hour before we were able to enter the court room and be seated. We learned afterwards that this wait occurred because the documents of each candidate had to be verified before the ceremony could begin. It is an impressive room we are in: a high ceiling with portraits of former judges displayed on all the walls. There was a center aisle separating the spectators from the 50 candidates for citizenship–people of varying shades of skin and ages from 26 previous countries. Lancaster County Common Pleas Court Judge Leslie Gorbey was seated at her bench; below her at the attorney tables were several staff from the Prothonotary Office. Standing at a dais facing us was RoseMarie S. Sallemi, Naturalization Officer from the U.S. Citizenship and Immigration Services Office of Homeland Security. She welcomed everyone and described how the ceremony would proceed. Judge Gorbey’s message had sewn a powerful thread into the fabric of these 50 new Americans. Stepping down from the bench she, along with a representative from the Prothonotary Office presented the Naturalization Certificates to each of the new citizens. In 2004 Esther attended the UN’s Permanent Forum on Indigenous Issues as one of the representatives from SIMOO. With hope for a better future and being able to support her family back home, she thought of pursuing her education. She was hosted by Maasai friends in New Jersey and in 2005 enrolled at Mercer County Community College where she received an Associate’s Degree in International Studies. How slavery began and became a part of America’s history should not be ignored; it’s part of the fabric of our Nation–including intolerance that often rears its ugly head against Black Americans. In 1619 Europeans invaded Africa then shipped less than two dozen captive Africans to America — they were considered Indentured Slaves. After that shipment, history records that throughout the next two centuries, four million Africans were snatched from the Motherland and shipped to America. Squeezed like sardines in the belly of ships, my ancestors struggled to stay alive as they floundered amongst human waste and often the dead. After a journey that usually took three-to-four months, when these ships reached America, the stench drifting from their vessels was so overwhelming that people on the shore could smell the odorous cargo a mile or more before the ship reached the landing dock. Indentured no more, Africans were slaves–property–branded like livestock with a hot iron that identified the owner that became their ‘work horse’. When President Abraham Lincoln signed the Emancipation Proclamation on January 1, 1863 it was Freedom for slaves. No longer tied to their masters’ power many Free Blacks remained in their plantation cabins to begin a life to uplift their families. Yet there also were Free Black Men with no means to make money. They wandered throughout their towns and villages, ultimately jailed for vagrancy. These Freed Black Men became chain gang prisoners laboring in the fields of their former masters. Media reports of Blacks stopped by law enforcement only make the news whenever a killing is attached to that incident. No stats are kept, nor stats kept on the number of gun deaths in America. Hearing the stories of Black men getting stopped by police are incidents that’ve been happening for a long time. They’re no stranger to my family. Name? Driver’s license & registration? Where are you coming from? Where are you going? … and a day later on July 6, 2016 a traffic stop in Falcon Heights, Minnesota caused the death of Philando Castile–age 32–also from a police officer’s revolver. Then … On July 7, 2016 we witnessed the shooting deaths of five Dallas, Texas police officers by a racist Black man during a gathering of citizens seeking Peace. These pieces of our history opens a beginning for a new Conversation about race relations in our Nation. I’m sensing empathy and understanding coming from our elected officials, the media and the public. I’m sensing that people of different colors will begin speaking TO each other instead of AT each other. For hundreds of years Ignorance and Racism have been the promoters parterning Intolerance. We must peel away those layers of prejudice and scattered them in the wind, never to return again.